Solar systems deliver energy all year, and homeowners from the Equator to the Arctic Circle are realizing the benefits of harnessing the sun for power. However, as anyone in colder climates can attest, ice and snow can present special problems for roof-mounted solar arrays. If you are installing solar systems in colder climates, then you should be prepared to address snow accumulation and wind loading before they create problems for customers and result in a service call. There is a common misconception that solar arrays don’t work as well in the winter in snowy areas. In fact, most homeowners in cold climates report extremely high efficiency from their solar output, often exceeding 100 percent of the power rating because snow on the ground increases solar reflection. However, to maintain peak efficiency, it’s important that solar panels remain clear of snow and debris, and that the installations are hardened against winter storms. 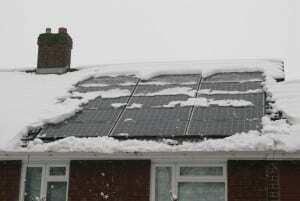 Snow accumulation on solar panels creates a variety of problems. Of course, there is the reduction in power output from snow cover; if your solar panels accumulate ice and snow they will lose efficiency. A light snowfall isn’t likely to cause any problems. The reflective nature of solar panels act as natural heaters that will melt light snow. It’s the heavier winter storms that dump inches or feet of snow that should be a concern. The solar panels themselves are light, weighing around 50 pounds for the average 5.5 foot by 3.5-foot panel. However, if you add a lot of snow to a solar panel the weight will increase substantially. An average cubic foot of snow weighs 20 pounds, so when you add a foot of snow to the average solar panel, that’s more than 380 pounds of added weight per panel. And that extra weight isn’t distributed evenly across the surface as with a sloped roof, it’s concentrated on the solar array mounting brackets, which means a lot of extra weight is placed on specific points. While snow loading won’t create an immediate issue for a properly installed solar array on a well-built roof, snow loading could create structural problems over time. Sloping solar panels can alleviate snow loading, and solar panels will generate enough heat to eventually melt even a heavy snow, causing it to slide off the panel. However, make sure that solar arrays are mounted at the appropriate tilt angle, to prevent snow accumulations. With winter storms come high winds. A solar panel mounted to a roof can act as a sail when the wind gets behind it, especially if the panel has been canted to address issues like snow loading. If the panels have been improperly or poorly installed, the mounting anchors are badly installed or weak, or the roof is weak, wind load could create damage. Even if the array doesn’t blow down the strain could create openings in the roof that can accumulate moisture. The best way to address the problem is with proper installation techniques. The Solar America Code of Boards and Standards provides recommendations for proper installation and has calculations you can use to assess wind loads. While solar arrays themselves aren’t affected by colder temperature, when it gets cold other challenges may arise. Solar arrays continue to generate heat, even when it gets cold, which makes them attractive to squirrels and other creatures looking for a warm location to nest. Having woodland critters nesting on the roof for the winter means leaves and debris accumulated under your solar panels that can promote roof damage. This can also create the unwanted risk of squirrels chewing through the electrical system and damaging wiring, which could require an unscheduled service call for you. That’s why it makes sense to use a protective barrier system such as SolaTrim. SolaTrim can be installed at any time of year to prevent pests from getting under solar arrays. The acrylic foam peel-and-stick adhesive tape used to attach the SolaTrim barrier to the solar panels has been tested for extreme cold, to -40 degrees Fahrenheit, and for extreme heat, to 300 degrees Fahrenheit. It also has been tested for extreme wind conditions up to 150 mph. For effective installation during the winter months, the SolaTrim barrier panels should be stored at temperatures greater than 50 degrees Fahrenheit in order for the adhesive to achieve maximum adhesion. Many of our integrators are performing winter installations, but they are keeping the SolaTrim boxes at room temperature prior to installation. With proper installation, SolaTrim can eliminate the winter pest problem. And it’s guaranteed for the life of the system.